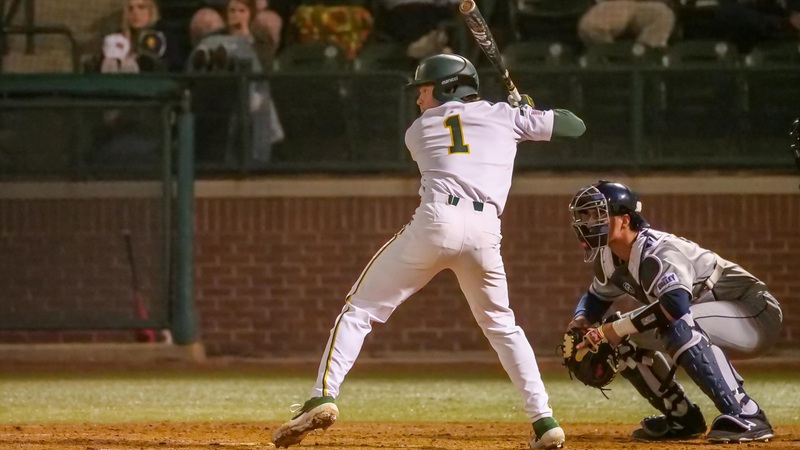 WACO, Texas – Cole Haring hit two home runs and Jimmy Winston threw six shutout innings to lead Baylor in a dominating 12-0 victory Saturday afternoon over West Virginia at Baylor Ballpark. The Bears (15-6) clinched the series win over the Mountaineers (13-9) and will go for the sweep on Sunday. Winston turned in a career-high six scoreless innings and four strikeouts on the mound. He lowered his ERA to 0.71, which was top 30 in the nation entering the weekend. After scoring two runs in the second inning, the Bears sent 10 batters to the plate in the bottom of the fourth and exploded for seven runs on seven hits. Chase Wehsener, Davis Wendzel and Shea Langeliers each tallied RBI knocks and Haring blasted his second home run of the game, a three-run shot over the right field fence, to push the score to 9-0. Baylor added two runs off a pair of wild pitches in the bottom of the eighth before Haring drove in his fifth run of the game with his fourth hit that extended the Bears lead to 12-0. Daniel Caruso made his 10th relief appearance of the season and threw two scoreless before turning the ball over in the ninth to Brooks Helmer, who made his first career appearance on the mound and retired the side in order to end the game. Winston (2-0) earned his second win of the season while WVU’s Jackson Wolf (2-2) took the loss. *The shutout was Baylor’s fourth of the season. *Baylor has won six of its last eight games. *Since inserting Nick Loftin in the leadoff spot, the Bears have scored 57 runs on 91 hits in their last seven games. Loftin is 11-for-30 with 3 HR, 6 RBI and 9 runs scored during the stretch. The Bears are 6-2 in such games. *The Bears have recorded an extra base hit in 20 of 21 games this season. *Baylor has stolen 25 bases this season on 31 attempts as Davis Wendzel stole his team-leading ninth base of the season. The Bears were 34-for-51 when trying to steal in 2018. *Shea Langeliers has caught 4 baserunners stealing this year, including each of the last three that have tried to run on him. *Jimmy Winston punched out a career-high four batters. *Cole Haring recorded his second-career multi-home run game, launching his team-leading fourth and fifth home runs of the season. *Haring’s five RBI tied his career high. *Haring’s four hits are a new career-best. *Five Bears had multi-hit games (Loftin, Wendzel, Langeliers, Haring, Wehsener). *Langeliers has tallied seven hits in his last 11 at-bats. *Nick Loftin has an eight-game on-base streak. He picked up his team-leading 13th multi-hit game of the year. *Andy Thomas extended his on-base streak to eight games. *Haring has a five-game on-base streak. *Brooks Helmer made his first career appearance on the mound. 5 – Cole Haring drove in five runs and five Baylor players recorded at least two hits. “I thought it was a great performance all around. I was really happy with the way Jimmy Winston went out there and really competed. He threw strikes and let his defense make plays. Then our offense did a great job being able to maintain the pressure on them against a pretty good West Virginia pitching staff that was coming in throwing hard. I was really happy with how our guys played, they forced contact and really made them play defense and we were able to get some balls out of the yard which was great. The Bears will go for the sweep over the Mountaineers Sunday at 12:05 p.m. at Baylor Ballpark.